In an attempt to settle the “which way is best?” debate on the Garburn Pass, 8 riders set off from the Staveley car park after an unplanned brake replacement (good job there was a shop mechanic in our group for making a really fast job of it). Up the first climb east to west, then down the other side (WOOOT! 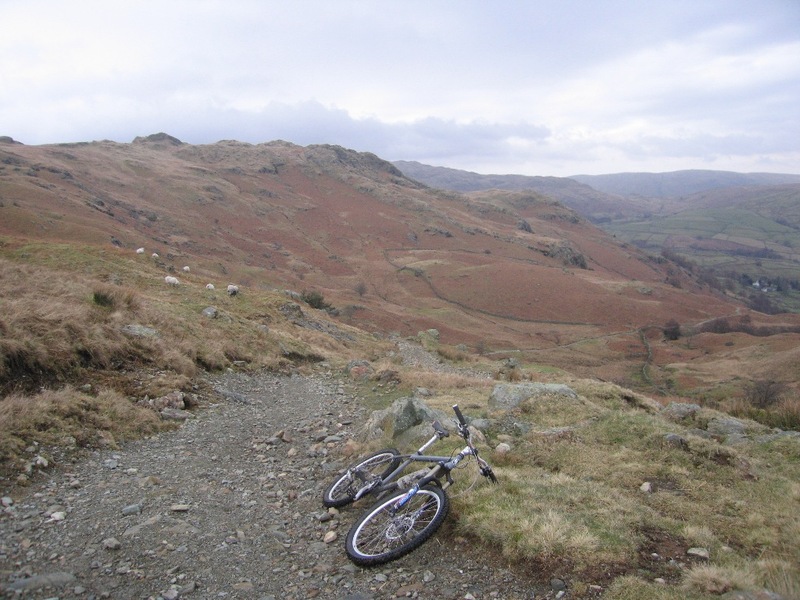 ), quick loop at the Troutbeck end then up the pass again the other way around. Then the superb descent back to the start. You can see one of our group in this photo (clicky) – follow the trail down and to the right…there’s a small black dot…. What an awesome ride. This one’s definately going to form part of the Cristalp training – a few hours repeating this climb is going to be a proper test of stamina and climbing technique. And which way is best? Well, opinion was divided between the smooth-but-steep speed merchants and the incredibly rocky-and-steep speed merchants. I’m on the fence. More guff from this ride and an actual photo with me actually in it at Industrial Fell Biking.